Danny uses his Iron Fist to have a punching contest with Nitro, but the exploding man can take the backlash better. 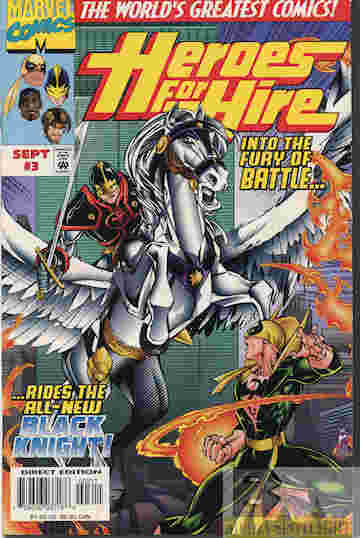 The Black Knight arrives and uses Nitro’s own power against him thanks to his magic shield and sword. The name Avalon strikes a cord with White Tiger, who reveals during training with Danny that she has a feral tiger form, which she is embarrassed about–or maybe it’s something else? Danny doesn’t have time to ask because Hercules is trashing a local bar. Danny and Dane confront Hercules, who admits he’s suffering “survivor’s guilt” since he was in space when the Avengers were lost, and had tried to lose himself in drinking and fighting, but is now convinced he needs to get back in control of himself and takes his leave of Heroes For Hire. While this was all happening the “Master” sought to convince Luke Cage to join H4H and serve as his eyes, to make sure they wouldn’t cross paths, and despite his proclamation that he wants to kill 70% of humans to restore balance (not all at once, because that would be bad for the environment), that’s exactly what Luke does. What they got right: The Black Knight gets a good first battle, showcasing the power of the Shield Of Night and Sword Of Light and how they work together. I like seeing Luke back on the team, though I’m curious about the reason, and there’s more mystery added to the new White Tiger, although hopefully there aren’t any new mysteries. Then again her reaction to “Avalon” is probably another mystery, or maybe the word is odd to her. I’m also glad to see Hercules get some character development. What they got wrong: Although I wonder why Ostrander bothered adding Hercules to the team only to drop him two issues later. Couldn’t being part of the Heroes be part of him finding himself, instead of sending him on a walkabout only two issues after he shows up? And Mr. Narrator breaks the fourth wall a bit too often here. I don’t think it works as well as the writer thinks, at least not for me. Recommendation: This is a fun superhero story, and it’s worth checking out. Posted by ShadowWing Tronix on October 3, 2017 in Marvel Spotlight, Yesterday's Comics and tagged Hercules, Iron Fist, Luke Cage, Marvel Comics, Marvel Universe, The Black Knight, White Tiger.